We all know Chicago has a great amount of bars and restaurants to choose from. But you know you’ve found a keeper when the instant you leave, you cannot wait to go back! We had the pleasure of having our Sugar Fix Team along with Dr. Jessica Emery over at The Other Side Bar. Located at 2436 N. Clark St in Lincoln Park, this cozy, laid back neighborhood hangout is the place to grab a bunch of friends and dive into some amazing food and drink specials. We absolutely loved all of the chalkboard drink specials, (which were being hand drawn as we were sitting there) and some amazing pizza we had the opportunity to try! 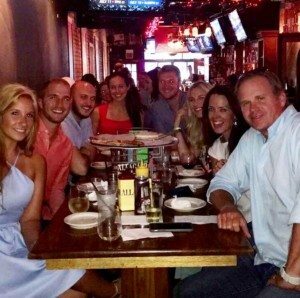 The Sugar Fix Team and friends at The Other Side Bar in Lincoln Park! When you first walk in, you see a bunch of comfy, plush couches where you and some friends can sit and relax while having a drink. Not only do they have a wide variety of great beers and cocktails, their menu of food has such great variety. We had the opportunity to have two amazing pizzas, which according to everyone at our table, the cheese was to die for. But across our way, we saw some customers who had placed an order of wings and we instantly took in that aroma. We glanced over and saw a large amount that was ready to be devoured. You could tell those guys were pumped due to their instant smiles that gleamed on their faces! But if you’re in the mood for something more filling say, pasta? Look no more! 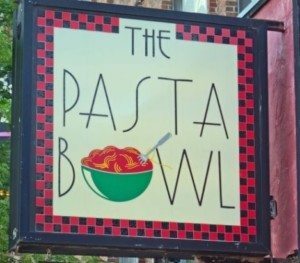 Conveniently connected to The Other Side Bar is none other than The Pasta Bowl. Where you can get some AMAZING pasta dishes, salad, crab cakes, and so much more. They also offer delivery, which you can never go wrong with. As well as catering for any events or meetings that you may have in the future. You will not leave hungry when dining or ordering from them, that’s a fact! Make sure to check out The Pasta Bowl’s full menu! Along with great food, great drinks, we must talk about the great service. All of the staff over at The Other Side Bar were so attentive to our group and made sure our glasses and stomachs were full. We enjoyed talking to everyone and loved getting to know Carlos, whom is the manager over at this great hangout. Being there, and experiencing the service, you can tell they take pride in their establishment and truly care about their customer’s experience. We will of course be heading back their way to try out some more food and drinks! 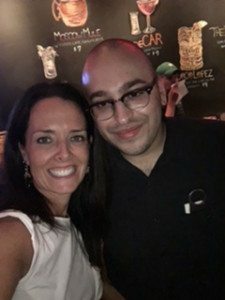 Dr. Emery with The Other Side Bar’s manager, Carlos! Make sure to follow them on Instagram @theosbarchicago and Facebook . And also head over to check out Pasta Bowl on Facebook and Instagram @thepastbowl. Keep up to date with Sugar Fix Dental Loft on Instagram @sugarfixdentalloft, Facebook, Twitter, and Snapchat @DRJESSICAEMERY to see what we are up to over here at The Dental Loft! We hope you have an amazing rest of your work week!